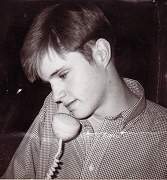 On the night of October 6, 1998, Matthew Shepard, a gay, twenty-one-year-old college student, was lured from a Wyoming bar by two young men, savagely beaten, tied to a remote fence, and left to die. The Gay Awareness Week was beginning at the University of Wyoming, and the keynote speaker was Lesléa Newman, discussing her book Heather Has Two Mommies. Shaken, the author addressed the large audience that gathered and remained haunted by Matthew’s murder. October Mourning, a novel in verse, is her deeply felt response to the events of that tragic day. Using her poetic imagination, the author creates fictitious monologues from various points of view, including the fence Matthew was tied to, the stars that watched over him, the deer that kept him company, and Matthew himself. More than twenty years later, this stunning cycle of sixty-eight poems serves as an illumination for readers too young to remember, and as a powerful, enduring tribute to Matthew Shepard’s life. Download the October Mourning Teacher’s Guide as a PDF. 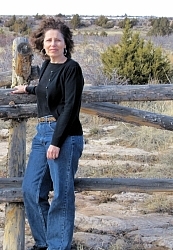 The author at the fence, Laramie, Wyoming. Photo by Plynn Gutman. 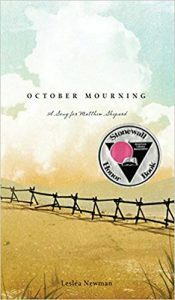 I was deeply affected by Matthew Shepard’s murder, and I wrote October Mourning to try to understand the impact this hate crime has had on the world and on myself. By telling Matt’s story in the voices of the silent witnesses (the fence he was tied to, the stars that watched over him, the deer who kept him company, etc.) I hoped to create a compelling narrative that would enable young readers to experience the intense emotions of that day which resonated around the world. Further, I hope that readers of October Mourning will be inspired to carry out Matt’s legacy of erasing hate and replacing it with compassion, understanding, and love. Each one of us can and must make a difference and make the world a safer place for all. From October Mourning: A Song For Matthew Shepard. ©2012 by Lesléa Newman. Reproduced by permission of the publisher, Candlewick Press, Somerville, MA. –Becky Walton, MLIS, Collection Development, printed in Ingram News and Reviews for the Youth Librarian. Read a review by Emilie Hanson. Read a review by Noah Stetzer.